新年快乐! Or to our non-Chinese speaking readers, Happy Chinese New Year! It’s been a huge year for members of #GenXYZ in China. We opened our China office, hired our first full-time employee, had our CEO Daniel give a keynote at World Hosting Day in Beijing and finally: .xyz became one of the first nTLDs to receive MIIT accreditation. That means, our Chinese .xyz adopters can now host their websites and see them go live and reach a global audience. 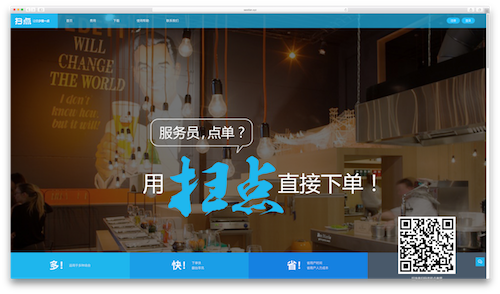 This week’s #WebsiteWednesday features one of those very first active Chinese .xyz websites, Saodian.xyz. Saodian.xyz is a QR ordering system that uses QR technology to speed up the ordering process at restaurants. Instead of waiting for your server to come over to your table and take your order, guests in participating restaurants can simply scan a QR code on the table through WeChat or Alipay. The restaurant’s menu then pops up and they can order directly with the kitchen and pay. Businesses can use Saodian.xyz to offer discounts to customers and benefit from needing less waiting staff, while providing faster and more convenient service to their guests. The biggest benefit for guests is that they won’t need to download any additional app, but can simply use the QR code scanner within China’s most downloaded apps WeChat and Alipay to be able to read menus, order, and pay with the help of Saodian.xyz. In the case of Saodian.xyz, the convenience of a simple idea has potentially huge reach across multiple industries. Saodian.xyz is prevalent not only in the food and beverage industry for meal ordering, but has also seen huge success as a room service ordering system in hotels and is a popular system to order snacks and drinks while users take in one of China’s most popular nightlife activies, karaoke. Saodian.xyz has taken a simple solution to bridge a gap in the Chinese food ordering market and built it into a successful platform. They didn’t stop there, however, and grew their service into a popular offering across multiple industries, just like the .xyz domain extension. Saodian.xyz is just one of many new .xyz sites going live in China, and we can’t wait to feature more of them in the coming weeks and months.